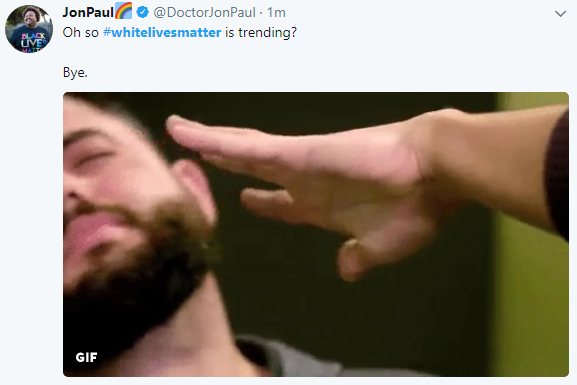 #WhiteLivesMatter is a Bad Idea. In its modern incarnation, Identity Politics is a reductive collectivist tactic to quickly form ingroup/outgroup biases. What I mean by this is that by accepting the Neo-Marxist concepts of the progressive stack and Oppression Theory, we begin to align ourselves with people ideologically similar to ourselves- and in ways that would have been impossible until now. A fragmented sense of self is inevitable. As I described in my piece on Neo-Marxism, the replacement for God, country or kinship is now the nebulous ‘diversity’. The perennial opponent will forever be the White, as white is not diverse. White is blank. White represents hegemony, in countries where the population is mostly White, and the colonialist/slaver to all peoples who are not White. White is a perfect boogeyman. We live in an age where identity politics is so pernicious that it has even fed back into the prevailing liberal culture. Where for some decades the dominant social meme has been an individualistic one, now it appears that collectivism is to strangle that dream. It’s almost like there’s an agenda at play here. I agree that no-one should be threatened with death unless they are actively trying to kill or otherwise harm people in the most heinous fashion, but this does not mean that anyone should take her seriously either. This is particularly true when Britain is one of, if not the most, least racist countries on Earth. Ms Bergdorf will wait a long time for Whites to acknowledge their guilt under these circumstances. While a majority of White America now think discrimination against Whites exists, we are faced with a conundrum. If feelings are as useful as facts, and Whites are now feeling oppressed, it behooves the Neo-Marxists to Listen and Believe their stories of oppression. This would require Neo-Marxists to be logically consistent- so don’t bet on it happening anytime soon. Instead, the Neo-Marxists would claim that White Privilege is protection enough, and sorry, you don’t get to play Identity Politics in the 2017 season. Try again next year. Unfortunately for them, there is no barrier to entering the field, bar the willingness to be called a racist for doing so. Seeing as ideologues like Ms Bergdorf call all White people racist by default, by birth and by culture, can we say that we are surprised by the rise in popularity of White identitarian movements? More to the point, can we now see that the Classical Liberal foundations of what we consider to be modern Western civilisation are all too easily subverted by collectivists? In troubled times it is natural for one to look for strength in numbers, for the easy camaraderie of similar interests- to reject the individualistic goal of the liberal society. This is true of all of us. In such times, it falls to the leadership of nations to provide what they are put in power to provide; a path. A goal. Reassurance that our values are defended from those who would corrupt them or overthrow them for their own anti-democratic interests. Here’s how to utterly fail to do that. This is Theresa May, the leader of the Conservatives in Britain. She talks in vague terms about vision, plans, and British values, while defining none of these things and doing nothing except crushing the life out of my country by having no sense of direction and trying to pander to groups who despise everything that she stands for. It is this utter failure of centrist parties like the Conservatives in the UK and both sides of Congress in the US that allows identitarianism to flourish. What shapes our identity? Is race a factor? Only if you are not White. It’s OK for everyone, except Whites. That’s fine, according to Neo-Marxist philosophy, because whites are the de-facto oppressors, purely based on the colour of their skin. Tell that to the Tutsis. We must accept that there is a racial element to culture. It is evident that this is true in that most country and western singers are white, while most hip-hop artists are black. It follows that people of all ethnic backgrounds appreciate the art and music of other cultures, as evidenced by hip-hop now being more popular than rock music. It is evident again in that Americans define themselves as ‘Ethnicity + American’. If we can understand such a simple corollary, then we also understand that there is a racial element to national identity too. As a mongrel Briton of no particularly unique origin, I have had the fortune to experience as an outsider the cultures of my friends in Scotland, Wales, Yorkshire and the Midlands, all of which have varying elements of their unique ethnic histories. As a foreigner in other lands, I have noticed the racial and ethnic influences on other countries, from North Africa and the Middle East to my wife’s homeland of Poland and our current home of Spain. The beauty for me has been in recognising the differences and the commonalities inherent within our cultures- this is how we are able to live in peace with our neighbours, to understand that their goals are not ours, but we can avoid conflict nonetheless, through dialogue. We are distinct peoples. It is the valuing of people that leads me to reject mindless multiculturalism as proposed by the leftist. For all Mr Trudeau of Ottawa likes to bleat about it, ‘value pluralism’ does not sell well to the public, and never has. ‘Life may be seen through many windows, none of them necessarily clear or opaque, less or more distorting than any of the others’. ~ Isaiah Berlin. You might understand this as cultural relativism. There is no truth, only opinion. In this mindset, all cultures are equal from all positions. Your love for your Italian culture (for example) should be worth no more to you than my British. The flaw here is obvious. You have far more kinship with Italy than the UK, so the only way for you to consider our cultures equal in your heart is for me to force you to do so. This milquetoast approach to differences in cultures is driven by a desire to protect society from racism, but in fact, only promotes it. I am forbidden from thinking less of your culture, but in order to treat all cultures with equal respect as I would my own, I must compare them. In the comparison, I can clearly see that the culinary arts of Italy far outstrip those of my country. Perhaps I become jealous of this. I can also see that my people have been better at making reliable automobiles than yours, and have a less corrupt government (just about). Perhaps I commit the sin of Pride. Even as someone without faith, the Biblical story of Joseph is a clear example of where Mankind still lives. The point is in comparison we recognise the differences that, instead of celebrating, we are simply not allowed to think about, and so leave us sinful. I deliberately used two European nations here to illuminate for you how difficult this is even without the addition of racial politics. Cheerfully, Liberal philosophy agree with me. It is not to say that a person from one culture is beholden to that culture for all time. We see the evidence of people adopting new cultural norms in second-generation immigrants and what the left sneeringly calls cultural appropriation. We also see the failure of integration and the pastiche of mocking other cultures for their difference. It is possible for people to integrate and become part of cultures that are not their own. It is possible to appreciate other cultures without cheapening them. This is the same issue. If we accept that cultures have a racial element to them, and this element is indelible, can a case be made for a protectionist attitude towards the rights of native people? If we take the position that the Western nations for all their myriad flaws are in fact the pinnacle of human civilisation thus far, and we accept that the national identities of these countries to some extent is based on the ethnic history and cultures of the inhabitants; then we must understand that the same protectionism that we would willingly extend to indigenous peoples in cultures that are not advanced as our own must equally apply to ourselves. My detractors on this point need only look at the numbers of non-Westerners who wish to live here to see the truth of my words. The Neo-Marxist will also point out that the West was won by conquest. There is no shying away from this. Similarly, we cannot go back. The sins of the White man are only more deleterious than those of other nations because of the fortune of the West’s success. Europeans were privileged enough to have suitable geography, climate and resources to grow rapidly in terms of technology. For example, the United Kingdom would never have dominated the world for so long if she were a landlocked country. The United States possesses gigantic resources that have been useful at every stage of development. The same cannot be said for the African nations, who despite having huge supplies of rare metals have been either unable to extract them until the advent of strip mining late 20th Century. A solid analogy is that you cannot ride a zebra into war. A city-state protected on all sides by mountains and the sea is perfect for the development of philosophy. My point is that for all the West’s conquering, we have been a product of our environments in exactly the same way as every other culture. This includes the development of the collectivist ideologies proposed by Black Lives Matter and other Neo-Marxist groups and the Far Right. Yes, Europeans nearly destroyed the world with war, but they also saved it. As we approach Remembrance Sunday, when the United Kingdom honours the dead of World War I, it is always a time to reflect and to remind ourselves that no ideology works perfectly. And some ideas are worth going to war for. We can only hope that under similar circumstances to our forefathers we would show the same integrity, sacrifice and courage. Lest we forget. Harking back to the example of The Greatest Generation is likely to get me dog-piled for glorifying racists. Well, so what. I’m not an extremist by any measure, but I can rely on Progressive darling Deeray Mckesson of Black Lives Matter to show me what one actually looks like. Which non-profits would those be, Deeray? 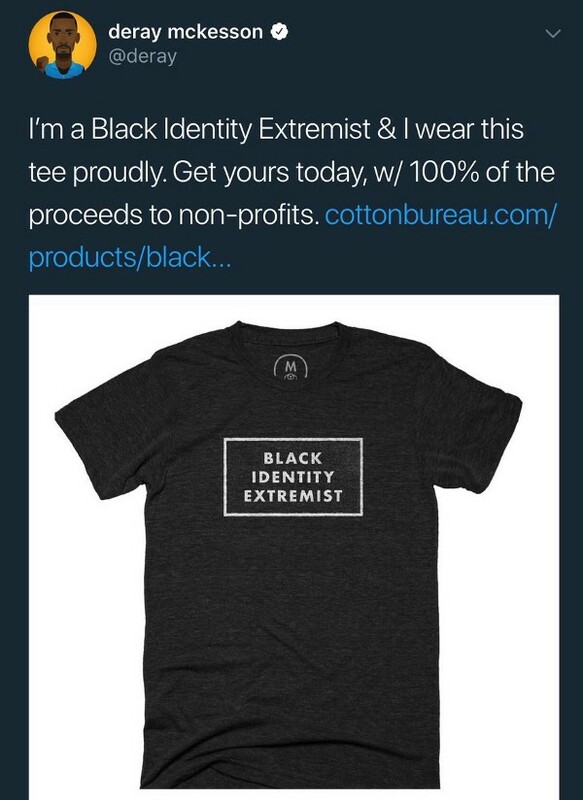 It’s ok to be an identity extremist if you are Black. Here is my intent with this piece, which I fear is a little clumsy. I wish us to start the reclamation of our collective identities from those who wish to divide and rule. To truly make our nations great again requires an understanding and respect for the nation in which we live. I do not believe that this is necessarily a racial or ethnic issue- although as I stated above, culture and therefore nationhood have a significant racial element that cannot be denied. Therefore, to preserve national identity, there must also be an understanding of preserving racial identity, should one wish to do so. This is a hard duality to grasp, and no doubt those on the Alt-Right will tell me this is impossible, the dream of a fool. I still contend that there must be a way to recognise the role of Identity Politics without succumbing to ethnonationalism or to the postmodern dissection of every value we hold dear. When people tell me that the UK is a racist country, I feel anger for I know this not to be true. I imagine for my American readers you feel the same when you are told America Was Never Great. For me, as an immigrant in Spain, it is my pleasure and honour to learn the ways of this country and her people. In doing so, I accept my role as a foreigner in their lands and acquiesce to the democratic will of the Spanish. In such a way, I am simultaneously an immigrant and a Spanish patriot. This is my concession to the identity politics of the Neo-Marxist. I lovingly accept my British heritage, my Wife’s Polish history and great culture, and the over-arching suzerainty of España for all matters pertaining to my domestic day to day life. I do not vote here. I pay taxes. The direction of Spain is for the Spanish- even when there are current events that cause me great concern. Are Identity Politics and Individualism Mutually Exclusive? European people over the last century have been stripped of the rights of group interest. Rules are different today of different races, and it has not passed unnoticed. If there is a population of westerners obeying the liberal ‘rules’ of fairness and equal opportunity, and migrants of collectively conscious individuals competing, one side is inevitably going to lose, given enough time. The problem is not one of a clash of races. It is one of the Neoliberal economic demands for unending growth leading to an economic need for economic migrants. As victims of a flawed system, identitarian ideologies are at loggerheads. Through diversity quotas and affirmative action, the well-meaning liberal societies of the West have fallen into a trap. We have become prey to a culturally relativistic system that enacts policies literally entitled Replacement Migration. One does not even have to be an identitarian to understand that concept. Our populations are ageing. And yet, the birth rate is negative for indigenous Britons. Rather than consider that perhaps it is the economic system itself that requires modification, our rulers have decided that demographic change is entirely separate from culture, and unlimited migration can be advocated for so long as the taxation levels do not fall. All evidence shows this to be wrong. We can see this well in the post-war creation of the state of Israel. In the following few years, the Jewish populations of almost all other Middle Eastern countries dropped to near zero. Where did all these Jews go? To Israel. Their absence in countries like Algeria or Iran is noticeable, and surely had an effect on the culture of those countries. You could even say the formation of Israel itself is the example of what mass migration to a region can do to the culture of that region- where once the British Empire curated a Palestinian Protectorate, a backwater colony with little tactical value beyond the Biblical, today stands one of the most advanced nations on Earth. This is, unfortunately, a far better situation than the West finds itself in today. We are being replaced by immigrants who do not share the cultural values of the West and do not care to grant Western nations thanks or consideration. Under such circumstances that are probably understood by the Alt-Right better than most because they care more about race politics than you do, it is no surprise that their ideology is growing. Those of us who are not on the Alt-Right would do well to pay attention to their concerns. Turning a blind eye will not save us. Individual rights are amazing. Collectivist power smashes these rights to pieces unless those rights are met by an equally powerful collective consciousness that considers the rights of the individual to be paramount. The answer to this paradox is the key to defusing the inherent violence of tribalism. The answer is the key to Making America Great Again. It is what was understood by our ancestors when facing fascism in Europe- collectively, the free world took up arms. Today, to preserve these nations and ideals, immigration, as it stands, cannot continue. The globalist agenda must be resisted, and for this at least we can hope that we are on the right track with the election of President Trump, Brexit and other anti-globalist movements. How do we ameliorate the concern of the Alt-Right concerning replacement migration? Should we even try? It is hard to engage the Alt-Right on the topic when their answer is the practical or philosophical Ethnostate, which they correctly claim is a term that can be applied to many nations that exist today. This concept is so unwieldy that there is no consensus on how such a state would be achieved. My suspicion with the Alt-Right is that even with a total moratorium on migration, it would never be enough. Preservation of personal choice entails that we are also free to take part in the dreaded miscegenation. The Alt-Right are free to disapprove, but they are not free to force us to not race mix. Even so, all humans feel a shared kinship with people of the same race. It’s a normal reaction that we all experience. Regardless what race we are, there is an innate bond at some level which manifests itself in an in-group preference for those who are like ourselves. The Neo-Marxists call this phenomena unconscious bias when white people do it. It might charitably be considered ethnic nepotism when minorities do the same. When Black people manifest racial identity, its decolonisation. It’s a black pride. It’s a positive identity to possess. When White people manifest racial identity, it’s supremacy. It’s Racist. White pride does not exist because ‘White’ isn’t a race in the same way that ‘Black’ is, because of Slavery/Colonialism, delete as appropriate. The entire concept of a hierarchy of the races- which is what Privilege Theory proposes- is simultaneously insane and damaging. Insane, because while there are clear biological differences between the races, the social construct of race that is endorsed by both Neo Marxists and Alt-Right is built on sand. One side claims that white people are privileged by default. This is codified language. What this means, and is only now being admitted by Neo-Marxists, is that Whites are racist. All Whites are racist because White society is racist. Whites, therefore, have inherent advantages just for being White. Whites are a monolithic superpower which literally kills people of colour by their existence. A racist idea which simultaneously demonises one race and infantilises the other. Because it is now unacceptable to challenge such narrative without being considered to be a racist by leftist ideologues means that all of us are racists by default, merely for existing. Under such circumstances, we can think ourselves incredibly fortunate that the Alt-Right has not found high-quality intellectual leadership who would capitalise on what is a gift to race-realists. For example- let us pick any innocuous event. A person has an interview but does not get the job. Depending on the races of the interviewee and the successful candidate this is either an example of White supremacy or an overbearing nanny state; unless both candidates are non-White. Even then, the Blacker-than-Thou woke intellectuals of the Left trying to figure out who is most oppressed can tie themselves in knots. We must be as the sword of Alexander the Great. To the left… well, to fail to accept their racist doctrine is to become a racist. This albatross when hung from your neck removes the possibility of nuance, and prevent adherents from countenancing the explanations that do not pass through the ideological lens. Like a piece of tinted glass through which only certain light waves can pass, when you are obsessed with race, race is at the root of everything. Regardless of how alluring collectivism can be, recognise that it is ultimately counter-productive to our culture. Because you and I share a nationality or ethnicity does not mean we must be friends. Our individual and often conflicting goals in the world must be prioritised while recognising that threats to the rights of the individual by pure collectivists require a collective response. 2. Accept that groups act in group conscious ways. Politicians understand that pandering to minority interests is usually effective, provided it can be conducted in secret. This is why Clinton ultimately scuttled her own campaign by pushing so far with identity politics that the majority of the United States utterly rejected her proposal. In the United Kingdom we see the example of Islamic groups voting in blocks, organised through mosques and the inward looking and unintegrated cultures they serve. The Muslim interest is served by their community organisers, who pressure politicians to serve their interests above those of the majority, in return for guaranteeing their votes. In this collectivist fashion, an organised minority interest group can project far greater power than a disorganised majority. 3. Confront the dominant paradigm that promotes the idea of White people possessing no inherent culture. The Neo-Marxists say Whites have no culture, but also that Whiteness is toxic. Reject this racism with all your heart. All lives do matter. The broad family of European Culture and her descendants is just as valid a culture as that of La Raza or the African Diaspora. 4. Resist the demands of supremacists. Neo-Marxists and Globalists push demands for open borders. White supremacists demand closed borders and an insulated society. Both are extremist positions, and we must recognise them to be so. It is easy to see that the white supremacist position is such, but how much harder it is to make the case that replacement migration is a racist policy. It takes time, and knowledge that you must acquire yourself. 5. Take interest in your culture. It is incoherent to listen to Neo-Marxists who cry about historical slavery or the oppression of women while simultaneously heeding their whinings about cultural appropriation. You have a culture, wherever you are from. Unless that culture is, for example, promoting the genital mutilation of infants, child marriage or the subjugation of women, feel free to be proud of your culture. It feels crazy that I have to write that knowing it is now a controversial statement. 6. Accept that extremists will always hate you. Nazi, bigot, cuckservative, alt-lite. This is a culturally conditioned response. The Neo-Marxist, inherently opposed to the concept of nationhood or tradition, is ever on the lookout for something to call Adolf the Destroyer. The ideals of what we call the greatest generation were to some extent nationalist, and in good faith. Today, those same men and women would be considered evil. Nationalism is not inherently an awful concept, nor is racial identity. That the Second World War was fought by Nationalists on all sides is of little interest to historical revisionists who wish to extrapolate National-Socialism and apply it as a critique of all concepts of national identity. Resist this if you wish your nation to survive. As men of the West and the inheritors of Western Civilisation it is my contention that we are faced with the grave consequences of replacement migration. We must accept this reality if we live in an evidence-based reality at all- that we are able to reject the fearful and regressive concept of an ethnostate.It does not have to be so. We do not have to fall as the Alt-Right tells us Western nations must fall if they do not adopt their answers to incredibly complex questions. That being said, we do need to begin putting the interests of Western nations ahead of those of other countries, as other countries and peoples put their interests ahead of ours. This is by no means a unique idea of my own. It is one that dates back to the Founding Fathers and beyond. I beg your indulgence for quoting so much of Samuel Adams, but I cannot break up such masterful prose in good conscience. In the state of nature, men may, as the patriarchs did, employ hired servants for the defence of their lives, liberties, and property; and they should pay them reasonable wages. Government was instituted for the purposes of common defence, and those who hold the reins of government have an equitable, natural right to an honourable support from the same principle that “ the labourer is worthy of his hire.” But then the same community which they serve ought to be the assessors of their pay. Governors have no right to seek and take what they please; by this, instead of being content with the station assigned them, that of honourable servants of the society, they would soon become absolute masters, despots, and tyrants. Hence, as a private man has a right to say what wages he will give in his private affairs, so has a community to determine what they will give and grant of their substance for the administration of public affairs. And, in both cases, more are ready to offer their service at the proposed and stipulated price than are able and willing to perform their duty. Do we consider the integrity of our national identities an essential natural right? I suggest that we should- no, I demand that we do so. Moreover, I know that there are many people in many lands who agree with Samuel Adams on this. This is why the #MAGA movement exists: because humans of many creeds understand that the transcendent freedom of man must be protected by a secure national identity. As Adams warned us against, there are political actors who would defraud us and inflict fear upon us so that they may strip us of our indelible right to our national identities. 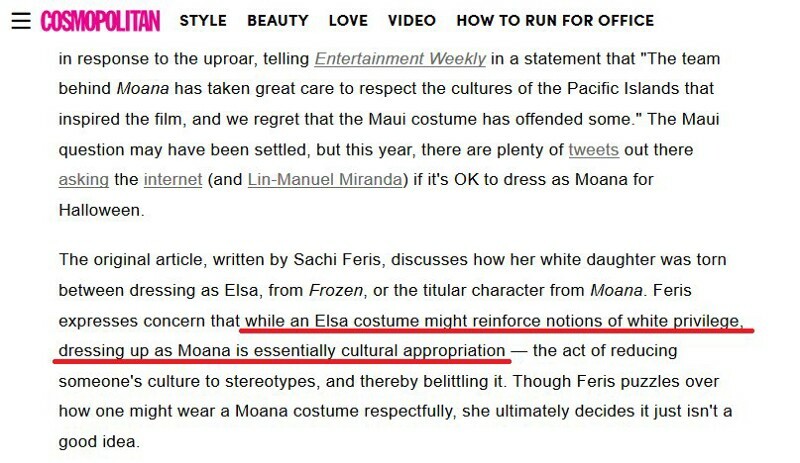 Our cultures are not for sale, cry the Neo-Marxists at Hallowe’en, or whenever the latest Pixar movie comes out. Do ghosts have white privilege? Just so. And neither is our culture for sale. More than the reductive and infantile chants of ‘Blood and Soil’ are our nations. Our freedoms are the gift of God Almighty, and the globalists who obey only neoliberal capitalism, Neo-Marxists who wish to control every aspect of society so that none can speak their mind must be repelled. To the Alt-Right I say; I understand your concerns but I disagree with your tactics and your predictions. We in the West might yet reach a day where I am proven wrong and the Alt-Right can laugh in my face, but it is not today. A free society, in which no person is experiencing unjust treatment and fundamental equality of opportunity is prevalent can still contain racial consciousness. It is evident that imperfect societies such as hours already contain these attitudes. Right now, we are considering that love for one’s own people is a racist attitude; provided you is White. At the core, this is the imbalance in our liberal democracies that leads to Whites affiliating with racial interest groups. It must end. The Neo-Marxists do not understand that an oppressive system will always fail. We see this with every previous totalitarian society in history, and let us make no bones- what the Neo-Marxist requires is an oppressive and totalitarian society. If we are a free society, we cannot permit, for whatever reason, one race to be prohibited from overtly considering their racial interests to be paramount. What I mean by this: you can stop the cringeworthy Nazi-LARPing at Murfreesboro by understanding that even Neo-Nazis have rights. This is how we de-radicalise the Alt-Right; by understanding that they’re not wrong about some of their concerns. The consequences of ignoring this truth will be far-reaching. While our ideals may be towards individual freedoms, the collectivist ideologies are growing. The consequence of burying our heads in the sand will be great bloodshed- either as the state reminds us of what true oppressive power looks like, or as racial identitarian and Neo-Marxist groups go to war in the street. In summary, when we accept that the very framework of working class White culture has been stripped by the predatory aspects of neoliberal capitalism we can see how we have arrived at an identitarian response from the same group. Migration, diminished financial security and rising house prices affect all working class people the most, regardless of race. We should neither dismiss nor be surprised by the rise of White identity politics to fill the void left by conventional politics. How we move forward at this point has the potential to define a generation.